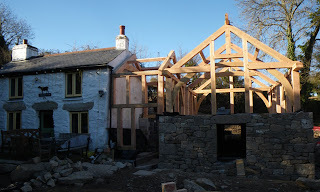 We've just raised this Douglas Fir and Oak frame in perfect March sunshine. We cut it in the workshop over Christmas and New Year, but the builder was held up by the wintry weather in early Feb and so it sat in the corner for a while, waiting for a sunny break. It went up in a day and a half over the weekend and was definitely worth waiting for the weather window. The oak curves tie in really nicely with the Douglas Fir frame, and although not as nice to work, the Douglas is a great cheaper alternative to using green oak, with excellent strength, longevity and local availabilty. It'll be externally clad in 400mm of Hemcrete, and roofed in slate, while the linkway will be weatherboarded with large glazed panels.